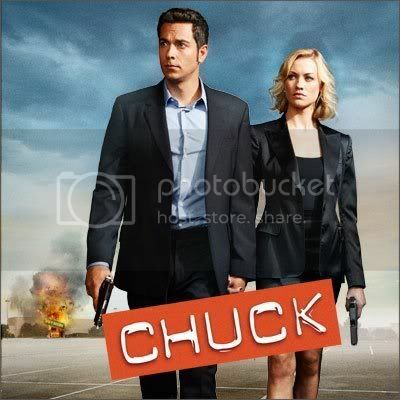 After a harrowing mission, Sarah returns to Chuck (Zachary Levi) with a huge secret. Meanwhile, Ellie and Awesome are presented with a new opportunity that could change their lives. Chuck enlists his family, friend and some unexpected allies as he races to stop Nicholas Quinn from destroying everything Chuck has built over the past five years. Who's ready? It's a bummer that one of my favorite shows will be going away (between Lost, Chuck and my lack of confident that Fringe will be staying around, I need to have a lot of faith in OUAT and Alcatrez. Hoping for an awesome finale, but really gonna miss it. Season 5 so far has been excellent so maybe it's a good thing they knew it was finishing. Those goodbye videos have been sad. Here's to hoping everyone is active in here tonight. Wow - full thoughts tomorrow - for now, wow. Long live the Nerd Herd. Long live the Buy More. Long live the intersect. LOVED the finale, all the callbacks were absolutely stellar!!!!!!! The final five minutes, with Sarah not remembering anything left me uneasy....did the kiss restore her memories? Some concrete evidence would have been wonderful. Is she still leaving Burbank and traveling to "find herself", leaving Chuck there all by himself? Leroi22 wrote: LOVED the finale, all the callbacks were absolutely stellar!!!!!!! Chuck didn't initiate the kiss, Sarah did. If she was leaving - Chuck would have been the one initating the kiss with her hesitant. Instead, she wanted it. We already saw her memories slowly coming back - to me, it was a sign that she was remembering, and through Chuck, Sarah would remember again, falling in love with him one more time along the way until she remembered it all. I'll end noting I also was a hopeless romantic growing up - so perhaps my vision may be more optimistic than others - but that's how I took it. Good insight Dharma, I have started thinking that way too after I let it digest a bit. An extremely positive viewpoint that I read was that Morgan WAS right, the kiss worked. As you notice Sarah didn't stop kissing him, which leads me to believe she was remembering everything. I would have LOVED a flash forward scene to them living in that house with kids, and everyone is over for thanksgiving or Christmas or something, but this way actually DOES allow them to do a season 6 if they get picked up. Or a movie.....that would be epic!! She remembered, or is in the process of remembering. She is staying with Chuck. No one is telling me otherwise. My heart can't take it. In some ways, I might have preferred Sarah remembering at the end of 5x12 so that in the final episode they were all together again for one last episode, but I really liked how it turned out. The callbacks and Beckman saying if they ever wanted to save the world again she'd be waiting... nice nod from the writers there! It's nice to see we're all not having a "Lost" reaction to this one. I will be writing a full-fledged review in here - hopefully within the next week - but I really was blown away at how many little cues they took to give a nod back to past moments in Chuck. So well done - some very clever one that were easy to miss as well. Ultimately though - yes, it's made very clear that Chuck and Sarah are going to be fine. I'm not in the "she remembered" boat - as in, it all just came back - but I think she's staying and clearly knows this is where she's supposed to be. I think the way it all worked out works great for everyone else too - as no company together means that Casey can go be with Gertrude, Morgan can take the apartment and live with Alex and Family Awesome can feel comfortable moving away, knowing everything is going to be alright. Frankly, I don't understand why some fans are angry that the ending was ambiguous. Have we not been watching the same show for 5 years? Of course they're still going to be together, they're the perfect couple. Whether she remembered straight away or slowly over time, it's obvious they'll be together. Leaving it like that was a great way to leave it to the imagination. As for a "Lost" reaction - I loved the ending to Lost and to the end of htis - so I guess I did have a "Lost" reaction. Amazing how I still compare everything to Lost. That said, the irony of the possibility of her "flashing" old memories with a kiss...I won't go there. The Jeffster performance was perfect. I'm glad they found out in the end. I couldn't envision them finding out before the end because I don't trust them to keep that secret while they are all in the spy world. As a former Morgan look-alike in season 1 (he changed his hair in season 2 and so did I...haha), I sincerely hope he's happy with his life as the manager of the Buy More or that he moves on. I like to envision him moving on. DharmaLager wrote: The Jeffster performance was perfect. I'm glad they found out in the end. I couldn't envision them finding out before the end because I don't trust them to keep that secret while they are all in the spy world. As a former Morgan look-alike in season 1 (he changed his hair in season 2 and so did I...haha), I sincerely hope he's happy with his life as the manager of the Buy More or that he moves on. I like to envision him moving on. So, what did everyone else think of the episode? Let's keep this conversation going - keep Chuck alive as long as we can!